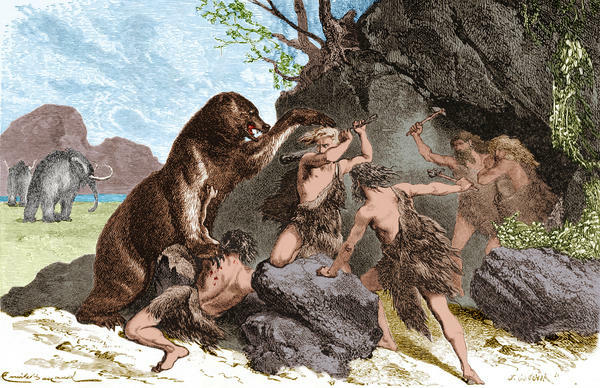 An illustration from 1870 shows Prehistoric men using wooden clubs and stone axe to fend off an attacks by a large cave bear. The cave bear (Ursus spelaeus) was a species of bear that lived in Europe during the Pleistocene and became extinct at the beginning of the Last Glacial Maximum, about 27,500 years ago. Mammoths can be seen in the background. Smith studied fossils going back 65 million years, when dinosaurs died and mammals came into their own. Many of the early mammals went on to get big. Among the giant creatures: "Llamas and camels and sloths and five species of pronghorn [antelope] actually," she says, "and certainly mammoths. And then lots of really cool predators, like Arctodus, the short faced bear." The short-faced bear stood 11 feet tall, about the shoulder height of some species of ancient camel. And that was just North America. Over time, Smith says, the downsizing of mammals affected the environment in ways you might not imagine--for example, in the erosion of the land. "When a large animal walks up a hill," Smith explains, "it zig-zags a lot, whereas a small animal walks up more directly, and that has an impact because water follows those game trails down, so erosion and vegetation and what-not are affected by that." Smith's research appears in the journal Science. Fellow paleo-biologist Rebecca Terry at Oregon State University says the new study shows that human influence on mammal size started in Africa, where humans first evolved. The effect on mammals then followed their travels. "And eventually the spread of modern humans, Homo sapiens, (moved) into the New World," she says, "and at that point pretty advanced weaponry was definitely present, and the extinctions in the New World in North America and South America were really extreme as a result." Indeed, the Americas had been the last holdout for really big mammals, since they were the last populated by humans.